Following an investigation by UARC on opening night at the Salt Lake County Fair, we urge our supporters to join us in pressuring the fair organizers to immediately cancel all future scheduled performances of “The Great Bear Show,” a bear circus currently featured at the event. This morning, UARC filed an urgent complaint with USDA officials, alleging violations of the federal Animal Welfare Act (AWA) at the Salt Lake County Fair. 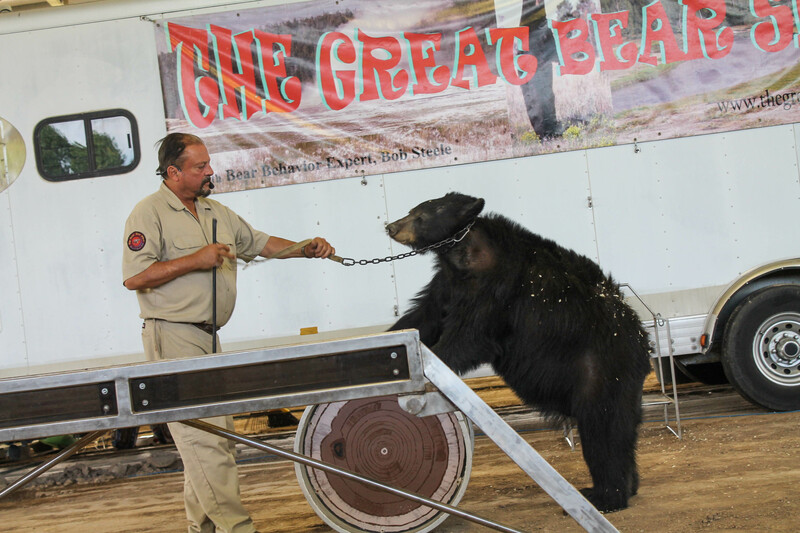 UARC investigators observed handlers tie an iron chain around the bears’ necks, where the bears appeared to be missing patches of hair. The bears were also pacing neurotically in their cages, a sign of significant stress. 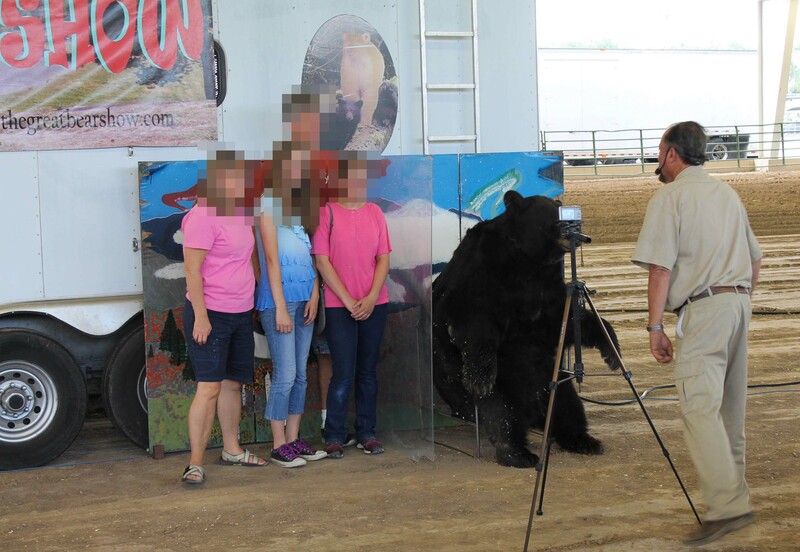 The animals were allowed close and unsafe contact with audience members who paid to have their pictures taken with the bear. 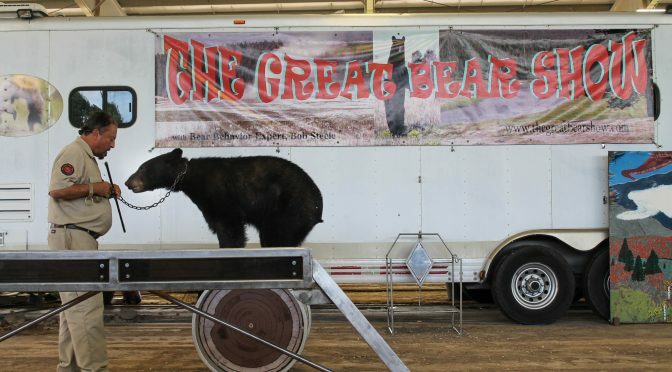 A closer look into Bob Steele, the owner of “The Great Bear Show,” reveals even more cause for concern. The USDA has issued Steele citations for violating the AWA on March 12, 2012, February 5, 2015, August 26, 2015, and March 7, 2016. One of his repeat offenses is failure to provide adequate veterinary care, demonstrated by significant hair loss on Barney, a young black bear in his care. 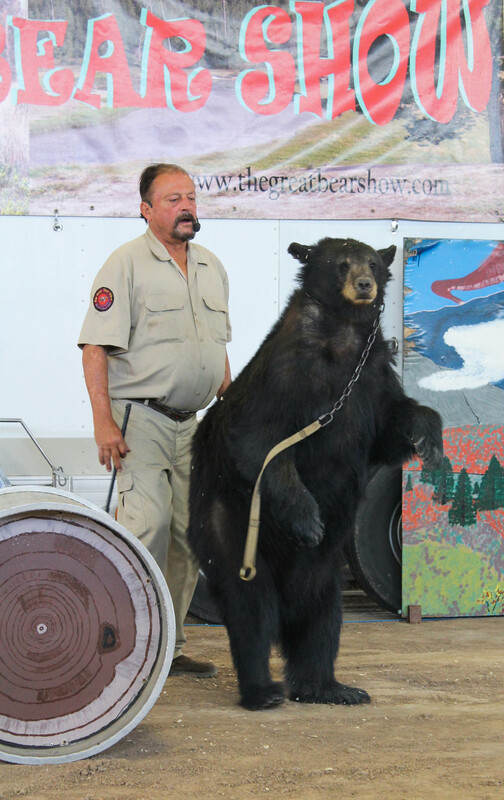 Despite being cited just months ago, Steele continues to wrap an iron chain around Barney’s neck, where much of the patches of hair loss have been documented, and make him perform tricks in front of small crowds of fairgoers. The Montana Standard also noted Barney’s hair loss at the Butte-Silver Bow County fair just two weeks ago. It is deeply troubling that Mr. Steele is still allowed to conduct business with animals despite his continued violations. The AWA enforcement system is profoundly broken and fails to protect animals. 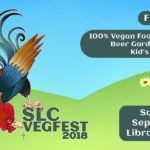 Animal abuse is inconsistent with the values of Salt Lake County. Sign UARC’s change.org petition asking that the County prohibit the use of all exotic animal circuses and performing animal acts at county-owned facilities. Share on social media and encourage friends to sign. If you are a resident of Salt Lake County, contact your County Councilmember directly to tell them you support UARC’s efforts to prohibit exotic animal circuses at the equestrian park.